SAN FRANCISCO -- Tesla pushed back a key production target for its pivotal Model 3 sedan again, raising questions about whether the electric-car maker may need to raise more cash. The company now expects to assemble 5,000 Model 3s a week by the end of June, delaying plans to reach that milestone by another three months. Tesla didn’t come close to achieving an initial goal to manufacture that many of the sedans a week by the end of 2017. Tesla’s slower ramp-up in manufacturing Model 3s led analysts to speculate another capital raise could be coming. The carmaker has been blowing through more than $1 billion a quarter as it’s had trouble scaling up output despite spending heavily on robots, assembly lines and tooling for the sedan that is Musk’s cheapest yet, starting at $35,000. “Bears will point to this as another missed promise,” Joe Spak, an analyst at RBC Capital Markets, said in a note to clients Wednesday. While a capital raise may not be required, Tesla lacks “a ton of wiggle room” and should seek more cash to mitigate risks, he wrote. Tesla shares fell as much as 3.6 percent to $305.68, before bouncing back during trading later Thursday. They closed Thursday at $314.62, down 0.8 percent. The stock climbed 46 percent in 2017 and the company ended the year with a $52.3 billion market capitalization, placing it ahead of Ford Motor Co. and behind General Motors. “We believe a fundraise will be necessary for Tesla in 2018,” Brian Johnson, an analyst at Barclays Plc, wrote in a report to clients Thursday. He projects the company will burn through $4.2 billion this year and assumes the company will raise $2.5 billion through an equity offering, likely during the third quarter. Tesla reported deliveries of 1,550 Model 3s in the final three months of the year, trailing analysts’ average estimate for about 2,900 units in a Bloomberg News survey. Including Model S sedans and Model X crossovers, Tesla delivered a total of 29,870 vehicles during the fourth quarter. The company delivered 101,312 Model S and Model X vehicles for the year, exceeding its forecast for 100,000 units. Sales of those more expensive models jumped 33 percent from 2016. In the months leading up to efforts to get the Model 3 up to speed, Tesla raised at least $1.2 billion through an offering of stock and convertible debt in March and another $1.8 billion by tapping the junk-bond market in August. Robert W. Baird & Co. analyst Ben Kallo said he sees Tesla having enough cash and additional liquidity sources to cover it through the revised 5,000-a-week schedule, meaning no capital raise will be required in the first half of this year. In a statement Wednesday, Tesla thanked customers “who continue to stick by us while patiently waiting for their cars.” The company announced the acquisition of Perbix, a closely held maker of automated machines used for manufacturing, back in November, a week after Musk cited challenges with automating Model 3 production. 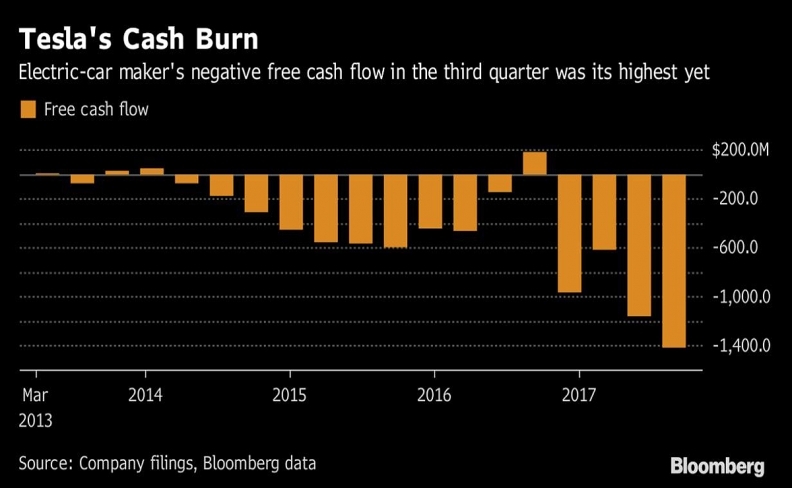 Tesla ended September with about $3.5 billion cash in hand and projected another $1 billion in capital expenditures during the last three months of the year. By postponing production plans, the company may also defer spending, said Jeff Osborne, an analyst at Cowen & Co. who has the equivalent of a sell rating on the shares. The company may need to raise another $1 billion to $1.5 billion over the next six months, Osborne said Thursday on Bloomberg Television. Tesla reported 860 Model 3 sedans were in transit to customers at the end of December. The company said it made significant progress on speeding up manufacturing of the sedan late last month, producing 793 units in the last seven working days. CFO Deepak Ahuja said during an earnings call in November that cash flow will improve significantly once Tesla ramps up Model 3 output because the company will collect money from customers before paying its suppliers. Cowen’s Osborne wrote in a report to clients Wednesday that the carmaker may need to raise more capital again in the next three to six months.